You can draw simple straight or curved lines using the Line tool. The line will be added to your artwork as a simple pencil stroke. In the Timeline or Thumbnails view, select the panel, then layer on which you want to draw. In the Tools toolbar, select the Line tool. In the Stage view, click and hold where you want the line to start, then move the mouse cursor where you want the line to end. If you want to snap the angle of your line to the nearest 15° angle, hold the Shift key. If you want to snap the end of your line to the nearest shape, hold the Alt key. 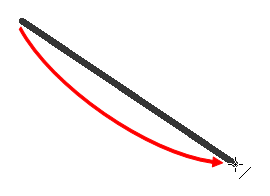 If you want to draw a curved line, hold Ctrl (Windows) or ⌘ (macOS). The line will end where your mouse cursor currently is, and moving the mouse cursor will pull the line's curve towards it. TIP You can use the Contour Editor tool to tweak the shape of your line—see About the Contour Editor Tool.